This luxurious 170cm matte satin wedding sash features a beautiful pattern of pearl & crystal clusters set amongst rows of fine pearl seed beads and sparkling crystals. The detail extends across the front of the sash approx 29cms, with beautifully finished bias cut tips on ea.. 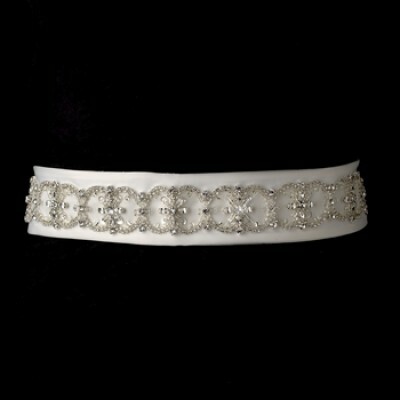 This is pretty, ivory-coloured bridal sash is an easy and cost-effective way to give you wedding dress an added boost. Featuring vintage-style beading in a delicate floral motif. The embellishment includes bugle beads, Swarovski bi-cone beads and crystals. .. This ivory coloured bridal sash belt is a simple yet stunning way to accentuate your waistline and add extra wow-factor to your wedding gown. The satin belt is richly embellished with bugle beads, sparkling Swarovski Crystal accent stones, as well as faceted marquise and teardro.. This beautiful Bridal belt / wedding sash features an elegant 2cms wide ivory satin ribbon with crystal embellishment. The crystal embellishment extends approx 29cms across the front. There is a luxurious two-layered soft net flower which sits off-centre, a..
A medium-width bridal belt adorned with bugle beads and crystals An ornate design that adds interest and sparkle to bridal gowns. With a vintage feel, this wedding belt is perfect for vintage styled wedding days The main decoration is illuminated with a fine row of smal.. This is a beautiful medium size bridal sash in an ivory coloured silk. Adorned with small pearls, translucent bugle beads and crystals. 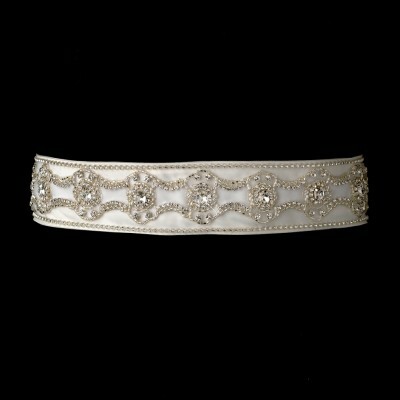 This bridal belt is vintage-inspired and will add a beautiful boost to wedding gowns and waist lines This bridal sash can be tied in..
Sophisticated and intricately designed, this beautiful bridal belt or bridal sash is accented with swarovski crystals, rhinestones and bugle beads. 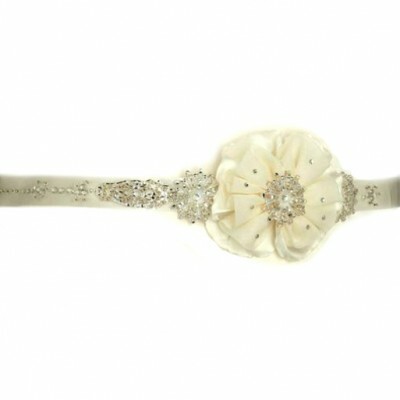 This vintage-inspired bridal belt will add a stunning finishing touch to your wedding gown, and add definition to the waist in .. 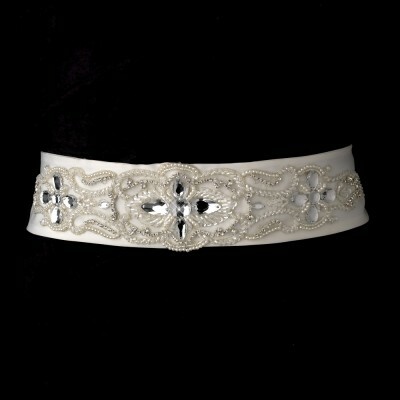 Bridal belts are an easy and affordable way to embellish your wedding gown. They add definition to your waist and elevate simple gowns in an instant. 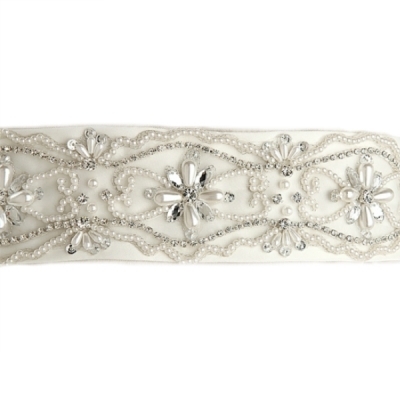 Our bridal belts are carefully crafted by hand and adorned with a tasteful mixture of pearls, crystals, beads and applique to blend seamlessly with your dream dress. 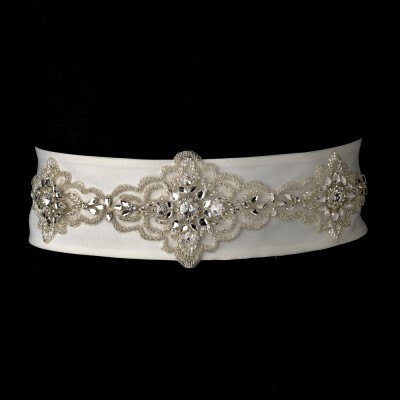 We've designed our bridal belts with a vintage-style bride in mind. These quality bridal belts will co-ordinate easily with all of the bridal jewellery options such as bridal earrings, bridal bracelets and bridal necklaces in our range. All bridal sashes can be sewn into the dress or tied in a bow behind. All sashes can be trimmed to size if required.